Retailers will be spending more on technology over the coming year, with websites and mobile, and new IT systems at the top of their agendas. Around two-thirds of retailers expect their business to grow this year, and a survey of the UK’s top 60 retailers found that shops are confident technology will help drive sales. More than 80% stated it would improve business efficiencies and the same number intend to spend more on technology this year than in 2013. 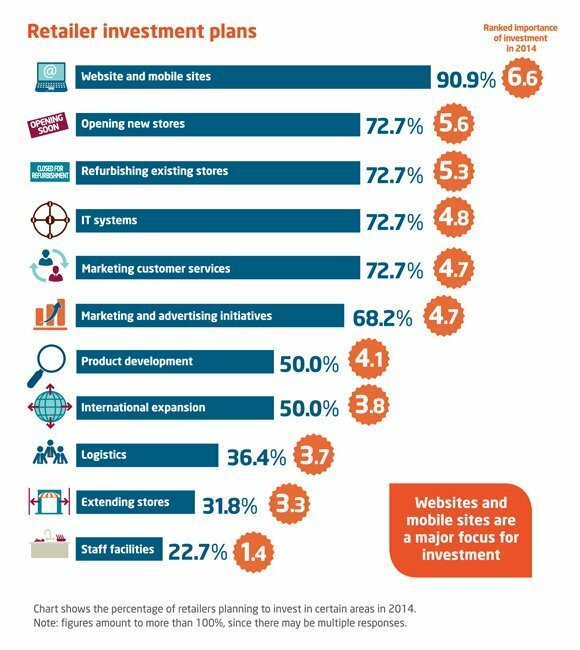 The Retail Growth Strategies Survey 2014, commissioned by the law firm TLT, noted that retailers were most enthusiastic about mobile payments, with two thirds planning to invest and 50% believing the technologies offer the best growth prospects. A quarter of those surveyed are already allowing mobile payments, while 38% plan to do so. Other technologies including in-store iPads, consumer apps and image recognition were interesting to around half of retailers, while almost a third are considering augmented reality (AR) technologies. Meanwhile, over half of retailers will invest in their eCommerce platforms to keep them up to date and able to cope with the rising demand for online shopping. Perran Jervis, head of retail at law firm TLT, said: “Retailers see the value in boosting investment in technology with a focus on how it can help co-ordinate product, price and promotion across all channels. This is a clear response to well-informed and price aware consumers who expect to use multiple channels simultaneously to research and buy products. 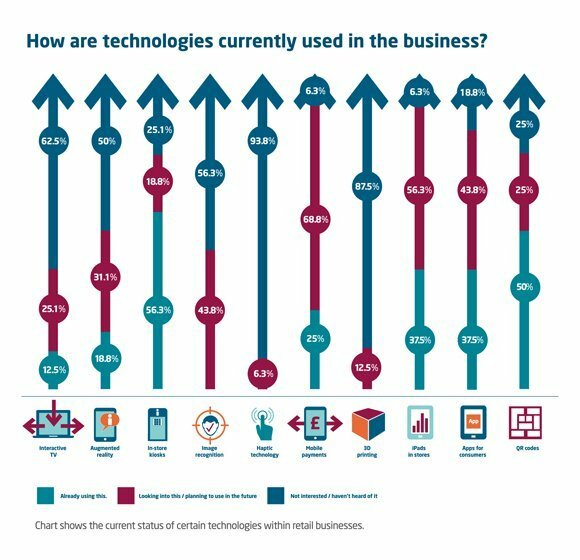 But despite the interest in technology, 88% have no interest in 3D printing and 69% of retailers haven’t heard of Haptic technology, which mimics touch through vibration. Additionally, when the retailers were asked whether they would opt for online or physical stories, three quarters would choose bricks and mortar. “Technology offers enormous opportunity but comes with significant risk: backing the right product at the right time, investing in the right skills and ensuring systems are compatible and optimised to meet the latest buying trends are not easy wins,” said Jervis. But the report stated the biggest challenge for retailers was the lack of internal knowledge and skills (75%), followed by the cost of data compliance. A total of 25% of retailers are worried about the costs of incompatibility of new technologies, while training staff worries about a third. Additionally, retailers want to see more support from Government, with 79% believing there is more to be done, including reducing the cost of parking in town centres and ensuring overseas-based businesses pay a fair share of tax.